One of the great things about condominium living and ownership is that your home is your castle. Your sanctuary. Your escape from the rigors and pressures of the outside world. When you come back to your condo at the end of the day, you are the master of your own domain. No one gets in without your express invitation – no one, that is, except for the danged condo board! Perhaps a touch dramatic here, but in all seriousness, the right to enter an owner’s unit by either the condo board or the complex’s condo management company is an issue that can raise a lot of contention. At the end of the day, people just aren’t very keen on having folks come into their homes on terms that aren’t necessarily their own – regardless of how brief or necessary the visit might be. 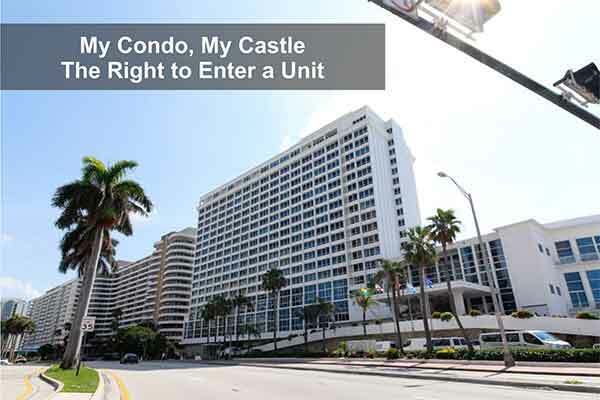 To dig a bit deeper into the rules regarding condo unit entry, we reached out to Laurie S. Kiedrowski, a Partner with McLeod Law LLP, who graciously agreed to walk us through all the ins and outs. delivered by email to an address provided by the owner to the board or condo management company. Now, of course, there are further stipulations to take into consideration. Kiedrowski confirmed for us that in order to enter a unit, the board or management company must be doing so on the grounds that they’ll be replacing, restoring, or renewing something that the main tenant (i.e. the owner) or other owners in the complex will benefit from. Further, this notice must be served at least 24 hours in advance of the intended visit. Entry must take place only between 8AM and 8PM, and cannot occur on a holiday or day of religious worship (according to the tenant’s calendar of observances). Finally, it’s important that the notice also details the reason for entry and the intended date and time in writing – simply verbally communicating any of these details is not enough. Of course, that being said, all of these stipulations are trumped by the possibility of an emergency. When it comes to emergencies, Kiedrowski informed us, all bets are off in terms of condo unit entry. As stated by the CPA, a unit may be entered if the individual has reason to believe that there is a crisis situation taking place inside (e.g. fire, flooding, etc.). This may be done without notice, and allows the entrant to replace, renew, or restore anything that might put a stop to the emergency situation. While emergencies are about the only acceptable reason to enter a unit without notice, a condo board or management company may also issue a notice of entry on the basis of bylaw compliance, as well. If the board or property management company suspects for whatever reason that the owner is not following a specific bylaw, they may serve a written notice and enter 24 hours later to ensure that all mandates are being followed, and that the unit is being utilized in accordance with the board’s governing rules and regulations. While having to accommodate entry into your unit can be an annoyance, Kiedrowski left us with the parting piece of advice that it’s always best for owners to co-operate in these situations (within reason, of course). While you might not be particularly excited to show that weird board member with the unibrow around your condo on a Wednesday evening, simply refusing entry can result in the board or condo management company obtaining a court order to allow them inside, oftentimes leaving the owner to cover the legal fees. Ditto if a locksmith has to be called – and have you seen their hourly rates these days?! The last thing you want is to have to pay through the nose just because you were trying to avoid the inconvenience of a 15-minute house call, so do what you can to accommodate requests for entry – especially when they follow all the proper protocols. We couldn’t be more grateful to Laurie Kiedrowski and McLeod Law LLP for taking the time to chat with us about condo entry regulations. If you’ve got more questions about entry rights, don’t hesitate to reach out to us at Catalyst Condo Management – we’ll be happy to address all your queries and concerns!